Autumn baking goes to a new level with this combination of two classics. A pumpkin pie. Rolled up in a cinnamon bun. Do we have your attention yet? That’s right … We took our autumn baking to a delicious new level by combining two classics, then topping them with an intensely good homemade caramel sauce. For added oomph, we then sprinkled our creation with flaked sea salt for a crunchy, salty contrast to all that sweetness. When slicing the log of dough into individual buns, a serrated knife works well. You also can use unflavored, unwaxed dental floss (or heavy thread). To do this, hold a length of floss (about 15 inches or so) by both ends. Slide the floss under the log and move it down to where you would make the first cut. Now lift both ends up over the dough log and pull in opposite directions across the log to slice through. Repeat with the remaining rolls. To prepare the dough, in the bowl of a stand mixer fitted with a dough hook, combine all ingredients and mix on low until the dough is soft and elastic, about 8 minutes. Alternatively, the dough can be mixed by hand. If so, in a large bowl combine all ingredients but start with 2 cups of the flour, then slowly work in the remaining 2 cups as the dough comes together. Turn the dough out onto a floured work surface and knead several times. Cover with plastic wrap and let rest for 15 minutes. Once the dough has rested, use a rolling pin to roll it out into a 12-by-18-inch rectangle. If the dough shrinks back, allow it to rest a little longer before continuing. Heat the oven to 350 F. Coat a 9-by-13-inch baking pan with cooking spray. Alternatively, line a rimmed baking sheet with kitchen parchment and coat with cooking spray. To prepare the filling, in a medium bowl use an electric mixer beat together the cream cheese, pumpkin, egg white, ginger, nutmeg and cinnamon. Spread the pumpkin mixture evenly over the rolled out dough going all the way to the edge except on one long side (leave 1 inch of that long side bare). Starting with that side, roll up the dough into a log like a jelly roll, pinching the sides to seal. Using a sharp knife, cut the log into 12 rounds. Arrange the rounds in the prepared pan. If using the 9-by-13-inch pan, the buns will touch. If using a baking sheet, the buns can be spread out (and will cook slightly faster). Cover with plastic wrap and allow to rise until slightly puffy, about 20 minutes. Bake for 25 to 30 minutes, or until golden brown and the buns reach an internal temperature of 190 F.
While the buns bake, make the glaze. In a medium saucepan over medium-high heat, combine the butter, brown sugar, cream and cinnamon. Cook, stirring frequently, for 5 minutes or until slightly thickened. Stir in the vanilla bean paste and salt. 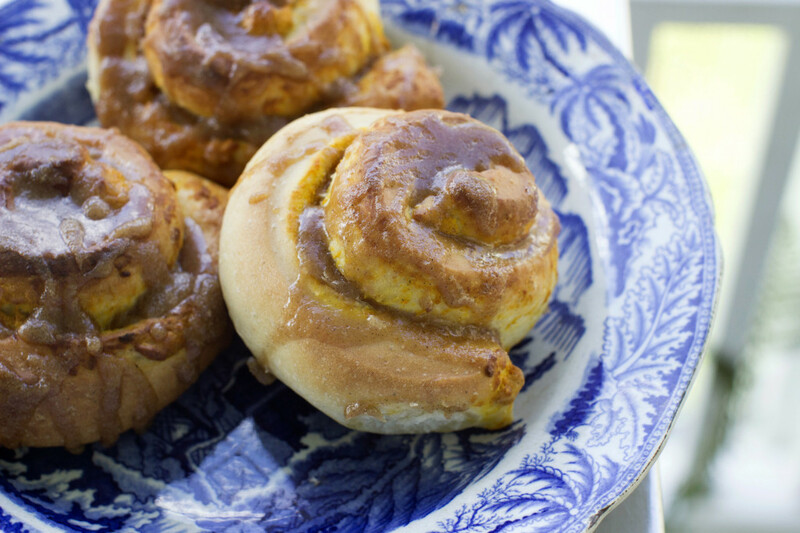 When the buns are cooked, immediately drizzle all over with the caramel. Allow to cool for 10 minutes before serving.